What were the early amphibians and when did they live? Amphibians were the first air-breathing land vertebrates, evolving from lobe-finned fish and primitive tetrapods. Tetrapods were animals with fishlike heads and tails, and with limbs that were little more than jointed, lobed fins. They evolved around 340 million years ago during the late Devonian period. So far, the oldest of these pre-amphibian fossils have been dated at approximately 360 million years old. These animals could do something that no fish could do: breathe air. The changeover from gills to lungs came during the early larval stage of the amphibian. These early amphibians were direct descendants from the early fish, and represent an important transitional stage from water-dwelling to land-dwelling animals. They were also the first vertebrates to eventually evolve true legs, tongues, ears, and voice boxes. The word “amphibian” comes from the Greek amphi, meaning “both,” and bios, meaning “life” (sometimes translated as “living a double life”). The name signifies that these animals could live both in and out of the water. The Carboniferous period of the Paleozoic era, from approximately 360 to 280 million years ago, brought about a proliferation of amphibians, as did the Permian, from about 280 to 248 million years ago. Much of the world’s climate during both time periods was warm and humid, with many swamps, marshes, and lakes dominating the landscape—a perfect environment for the water needs of the amphibians. In some texts, the Carboniferous or the Permian periods are called the “age of amphibians” (although many scientists agree that reptiles began to take over the amphibians’ domain during the Permian). 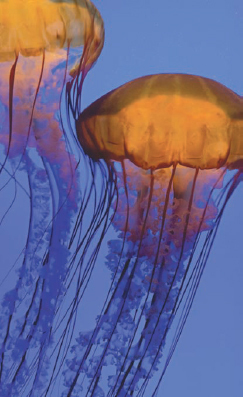 Still around today, jellyfish were some of Earth’s first soft-bodied life forms (iStock).